Today, we are thrilled to release brand new WordPress Single Post Templates, giving you an even better starting point when using our Theme Builder. When we released our Theme Builder’s Single & Archive templates, we wanted to empower WordPress professionals to take control over their blog design. While many users have incorporated Elementor’s Theme Builder & Single Template in their day-to-day workflow, others prefered to wait until more pre-designed single post templates were added. We received numerous requests from users to add more templates (the first batch included only 2 single templates). Pair this with the fact that Elementor templates have been used over 4M times, and you can start to grasp the need for the templates. You asked – we listened. 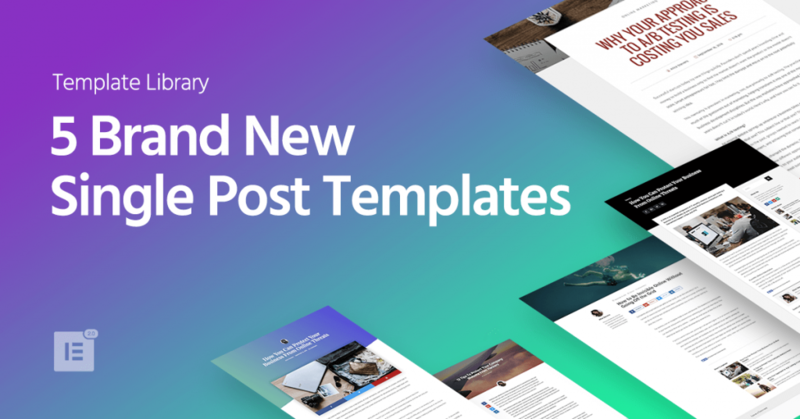 Here is a new batch of 5 single post templates that offer a great starting point for building your custom blog design. As a bonus, we went along and improved the first two blog post templates. Check out the full set below. Note - Getting the New Templates If you are a pro user, the templates should appear when you open the library popup. If you don't see the templates, go to Elementor > Tools in your WordPress Dashboard and synchronize the library. What Is A Single Post Template? For those of you who are not familiar with the Single Post Template yet, the single post determines the layout of your blog posts. For single posts, you use dynamic widgets to build the blog post template. 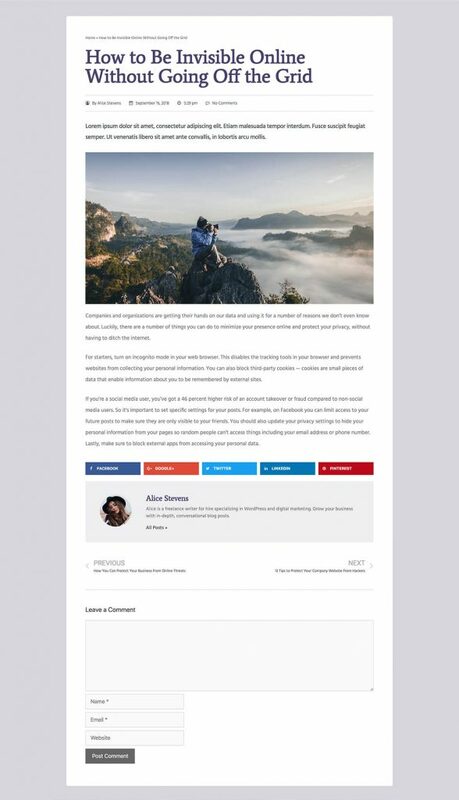 To make it easier to design live, you can preview the template with any of your previously created blog posts. 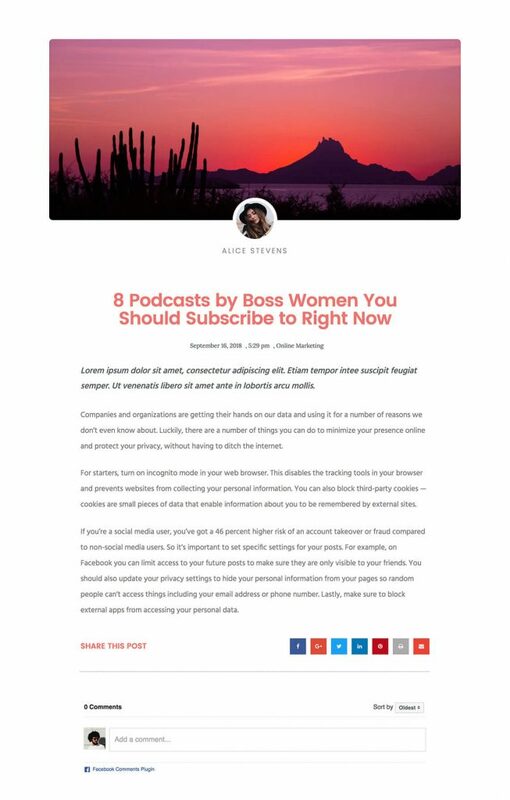 This way, all the dynamic widgets get populated with actual content from your site. Here is an article explaining how to use single post template. Even after you publish a single template, you can access any specific blog post that uses the template and design it further with Elementor. You can choose what kind of use you make of the templates. Many users will implement them as is, without making any customizations. Others will change the color palettes or fonts, or resize the image, and that will be it. Others, probably the more advanced users, will break the templates down into particles so they can “study” them, and draw creative ideas from them. Get Elementor Pro, the ultimate WordPress design tool, and control every part of your website, without theme or code restrictions. Make Your Own Custom Single Template! It’s time to take your blog post to the next level. Start exploring these templates and see how easy it is to build a complete blog post design from scratch. Want to see more templates? Send us your requests in the comments below! You are very big kings in the page builders market! Perfect post templates, thank you! They look great and one is about to save me some time. So thanks and cheers! Great template! Thanks! Its sure I’m will use one of them. Dont stop your good work guys! The templates look berautiful. Thanks Team elementor and Ben ! Can’t say enough about Elementor. You made my web design life much easier. These look awesome – thank you for all of the Elementor Pro goodies! How do I download these templates, please?? You can use them with Elementor Pro, they will appear at the single post templates. Can you give us a link to download these? Do the templates include Schema.org mark-up? I counted 7 😉 These look awesome, by the way! These look amazing! My favorite of the set is the green/blue gradient header with diagonal lines. Elementor just gets better and better! One area which is constantly overlooked is the importance of the About page. Site owners often spend days researching, writing and laying out an article About one-tenth of the effort is put into their About page, which is orders of magnitude more important than a single article. With your next addition, if you helped out by showing them some alternative layouts with a list of headings they can write under, maybe more people will get the benefit of a well optimised About page, thanks to Elementor. Will they simply show up in the next update? How do we access them? Very nice, I would love to see some nice archive pages or blog home pages. Where is the download link for the templates? Do the custom templates pull blog post data from the native WordPress query? My blog pagination add on (domain.com/blog/page/2) but not found… But when I delete “page” manually (domain.com/blog/2) works, how fix this in elementor? Please forgive this Total Newbie Question… but exactly where can I find these new templates? Do I need to download them from somewhere? Don, the templates are in the “Blocks” section. Thank you! I have been looking for a long time! Can you guys do a video on how to actually use these? If I’ve already created a blog post (custom) and try to use this template, I get duplicate data in the post. Very confusing and there’s no information on Post Excerpts or how to use them. Seriously all of these templates are eye-catching and amazing for anyone to start with. But do you have a way to import all of them and use some for a specific category posts and some for another? Yes they do. You can create a new template and use the conditions functionality to decide which category gets each template! These Simple Post templates are awesome! Great idea! great, I was waiting for new post templates. finally i got it. in future add more.. Thank you for these templates. Could you please also expand the default templates in Elementor Pro? And why not make available entire showcase sites with the right silons for SEO? Thank you in advance! Are there templates for home pages and pages that should all look the same? I’ve had the worst time trying to design my blog ? Where are the new tamplates for lawyers ? I appreciate your templates! Thanks! Hy guys, I can’t find the 5 themes anywhere. I synced my library, and still can’t find them. Please help. If you are a pro user, the templates should appear when you open the library popup. If you don’t see the templates, go to Elementor > Tools in your WordPress Dashboard and synchronize the library. Upgraded to Pro two weeks ago and cannot get it to work. So disappointed with support system ? Hi Bill, did you contact our support team? Does the single post template also control the comments? Also, what are the best dimensions for the featured image for these templates? Do you have any templates for WooCommerce pages? Cart, checkout, shop, single product, product archive, etc. I have adapted the layout to my needs. The readers of my blog appreciate the new layout. The only thing we need here is a vertical photo layout. Thinking on how to do my own.